We recently pushed another website live. ShipElec Electrical Wholesalers was first established in 2000 as a wholly owned, self-funded, family run business. At first the business operated from modest facilities with a single van both collecting and delivering to various local clients. In 2005 Ship-Elec (Electrical Wholesalers) Ltd was formed and the business grew in to its first small warehouse in Dartford then employing four staff members and continued to expand to 6 staff members in 2008. At that point the business had exhausted its growth potential in its warehouse and then moved to the Questor Business Park on Hawley Road, Dartford in January 2009. In 2012 ShipElec acquired the adjacent unit to the existing one and further expanded stock holding by 80%. Currently ShipElec are still in the same location but now operate with 22 staff and three delivery vans. 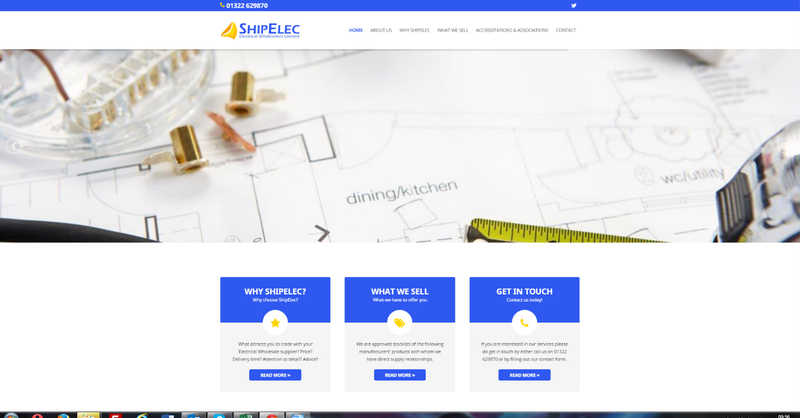 By strategic planning and being responsive to the demand of its customers ShipElec continues to grow and focusing on being competitive, well stocked, efficient and having good client relationships. ShipElec continues to be one of the quickest growing, wholly owned Electrical Wholesalers in Dartford and the North Kent areas.